Regional news – thank you Carin Crowe! The Winds of Change have been active in Manitoba and British Columbia thanks to the efforts of local KAIROS organizers. In Manitoba, the KAIROS Cambrian Agassiz group met with the Manitoba Ministry of Education and Training on August 25. Education and Training determines and develops the curriculum, so this meeting was particularly important. Read more. MP Romeo Saganash’s private member’s Bill 262 may go to second reading in Parliament as early as October 18. 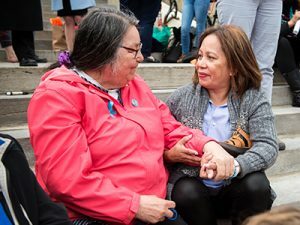 The bill seeks to ensure that the laws of Canada are in harmony with the United Nations Declaration on the Rights of Indigenous Peoples, which affirms the dignity and inherent rights of Indigenous peoples in Canada. Please ask your Member of Parliament to support Romeo Saganash’s private member’s Bill 262. Read more. Canada needs a legislative framework to fulfill the promise of this vital human rights instrument. Read more. With generous support from the Echo Foundation, KAIROS will hold a series of Reconciliation in the Watershed workshops this fall with local hosts across Canada. The KAIROS Reconciliation in the Watershed Program aims to increase the number and diversity of Canadians who are knowledgeable about their watershed, able to identify issues related to its protection, and can make connections between local ecological issues and Indigenous rights. Read more. One Reconciliation in the Watershed workshop has already happened in Tatamagouche, Nova Scotia. 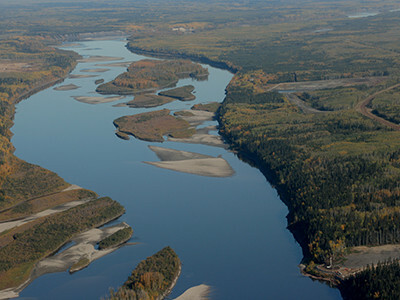 Over 30 people gathered on unceded Mi’kmaki territory for a day-long event to learn about their connection to their watershed and the people who live within it. Read more. Beginning this fall and running through to March 2018, KAIROS and its partners invite Indigenous peoples and newcomers in Canada to join in a series of reconciliation events entitled Indigenous and newcomer friendships for a just and inclusive community. 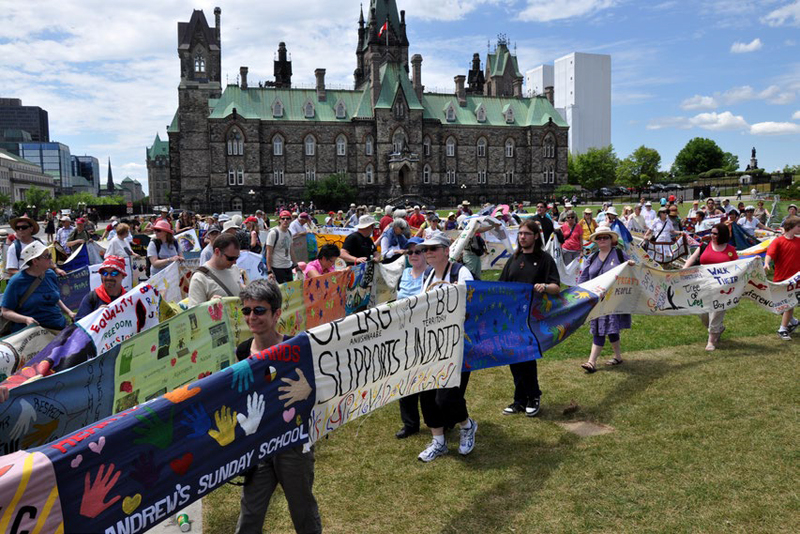 KAIROS believes Canada’s future can be strengthened by building relationships of respect and solidarity between newcomers and Indigenous peoples. 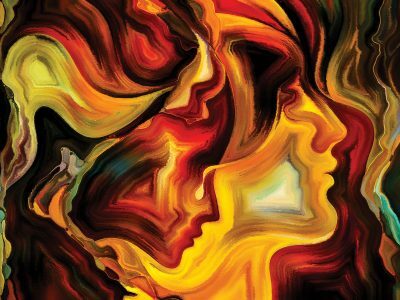 Events in Fredericton, Winnipeg, Saskatoon, Edmonton and Thunder Bay will explore opportunities, challenges and recommendations for building relationships between Indigenous, immigrant and migrant communities. Read more. In the September KAIROS Times you were alerted to the No Más II Tour this fall with two South Sudanese women visitors from the South Sudan Council of Churches National Women’s Programme. The tour will run from November 25 through December 10 to coincide with the international 16 Days of Activism Against Gender-Based Violence campaign. It will highlight the women, peace and security work of the KAIROS Women of Courage Program. Read more. This year’s theme is “Empowered & Empowering Youth”. Once again we are bringing together First Nations, Inuit, and Métis with non-Indigenous peoples to share ideas and learn from each other about the evolving relationship between Indigenous and non-Indigenous peoples in Canada. We are excited to host author and educator Dr. Jenny Kay Dupuis, a proud member of Nipissing First Nation, as our Keynote Speaker, along with Indigenous and non-Indigenous youth leaders in Ottawa. On Thursday evening, we will screen the film Birth of a Family, by Tasha Hubbard – a documentary that addresses the Sixties Scoop legacy. Register today. 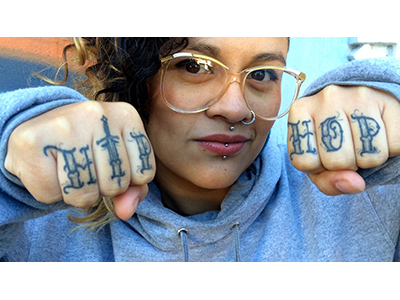 KAIROS is thrilled to sponsor the Mestizo Soul – Identity and Rights Tour with Guatemalan Hip Hop Artist Rebeca Lane, organized by Breaking the Silence and local committees. Rebeca Eunice Vargas (Rebeca Lane) is an acclaimed feminist, sociologist, activist and musician. This is her first tour in Canada. Read more. This important open letter to PM Trudeau signed by prominent Canadians was released on September 25. 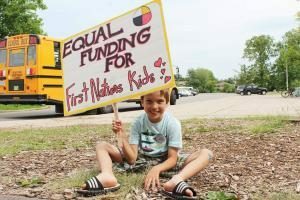 It calls on Canada to immediately implement the Canadian Human Rights Tribunal’s decision of January, 2016, which found that federal underfunding of First Nations child welfare and failure to ensure equitable access to public services constituted a clear breach of the Canadian Human Rights Act. Sign the open letter. Maps of Montreal usually show the neighbouring Mohawk Nation as an empty space. It appears as a grey block, sectioned off from everything around it. Nothing could be more symbolic of the relationship between the Montreal urban community, which numbers millions of citizens, and Kahnawà:ke, a little town of about 8,000 Mohawk inhabitants, known mostly for its sales of cigarettes, its annual Pow-Wow and for political restiveness. 2017 marks the fourth year that we’ve taken students and others and walked a 40 kilometer, circuitous route, from Old Montreal to Kahnawà:ke. Read more. 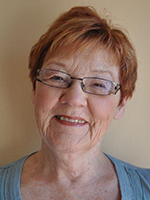 We offer a huge ‘Thank you’ to Carin Crowe for 5 years of dedicated service in the role of KAIROS Cambrian-Agassiz Regional Representative. Carin completed her term at the September 28 regional meeting in Winnipeg. 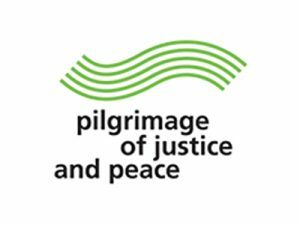 There are many, many volunteers across the country who give voice and hands to the KAIROS mandate of faithful action for justice and peace. The role of Regional Rep is particularly important as both the leader of a regional coordinating committee and as the “face” of the organization on the ground in the region. Read more. 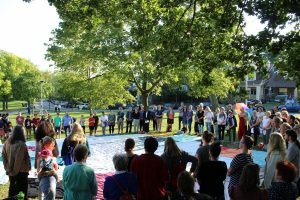 On September 13, three politicians representing all three levels of government from Toronto’s east end hosted the KAIROS Blanket Exercise in a local park. KAIROS is proud to offer a reprint of Indigenous Wisdom: Living in Harmony with Mother Earth. It was written by John Dillon, who died on June 5, 2017. Of all the writings he left behind, John was most proud of this booklet. You’ll find a tribute to him on the inside cover. 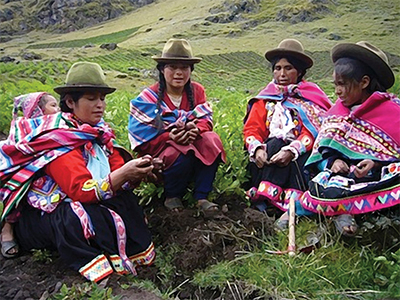 Indigenous Wisdom: Living in Harmony with Mother Earth is available as a free download or printed copy ($10) from the Resources section of the KAIROS website. “Everyone Belongs in the Kitchen” is a theme that raises a few questions. What kitchen? And, who is ‘everyone’? Read more. Peace is often misunderstood as an absence, a state of tranquil stillness where nothing is happening, there’s no conflict or change. The world we live in isn’t like that, and seeking to enforce an ideal onto the world can itself be a form of violence, called negative peace. Read more. 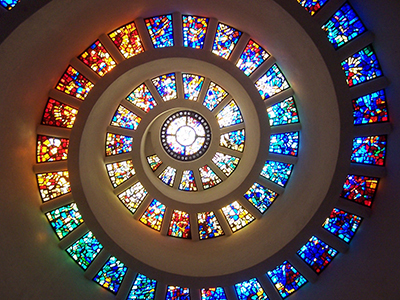 Living in Scotland was my first time praying in ecumenical groups. You might imagine, despite theological differences, that we always had the Lord’s Prayer in common, but I encountered differences between the English and Scottish versions, especially the line prayed in Scotland “Forgive us our debts, as we forgive our debtors”. Read more.